Don’t forget your camera! 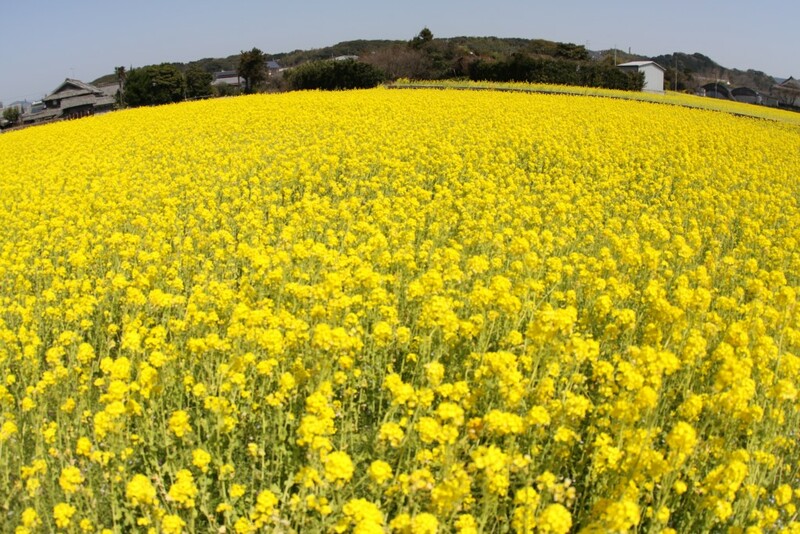 The canola flower fields of Fukuoka herald the coming of spring! The soft breezes that set the stage for springtime tell us that the best time to see the canola flower, as the flower of the season, is rapidly approaching. Here you will find numerous breathtaking locations that beg to be captured in photographs, beautiful views carpeted in gold as far as the eye can see. 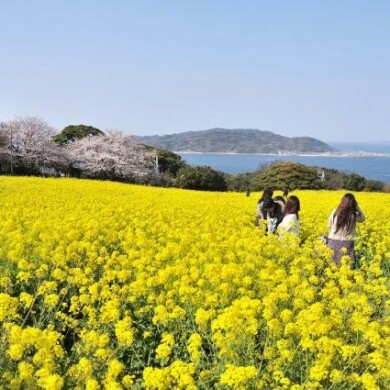 Here we introduce the most famous spots to view the canola flower in the Fukuoka city area, including places where you can also enjoy them together with the cherry blossoms. Nokonoshima Island Park is a concert between the immense vista and a chorus of beautiful flowers. 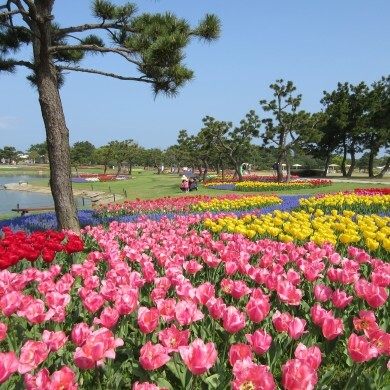 Visitors can enjoy a procession of different flowers in each of the four seasons at Nokonoshima Island Park. This is a natural park covering approximately 15 hectares on the north coast of Nokonoshima Island, reached via a 10 minute ride on the city run ferry from Meinohama, Fukuoka city. Here you will find different flowers year round, including canola flowers, rhododendrons, sunflowers, and cosmos. Among these, the canola flowers and cosmos are particularly famous. 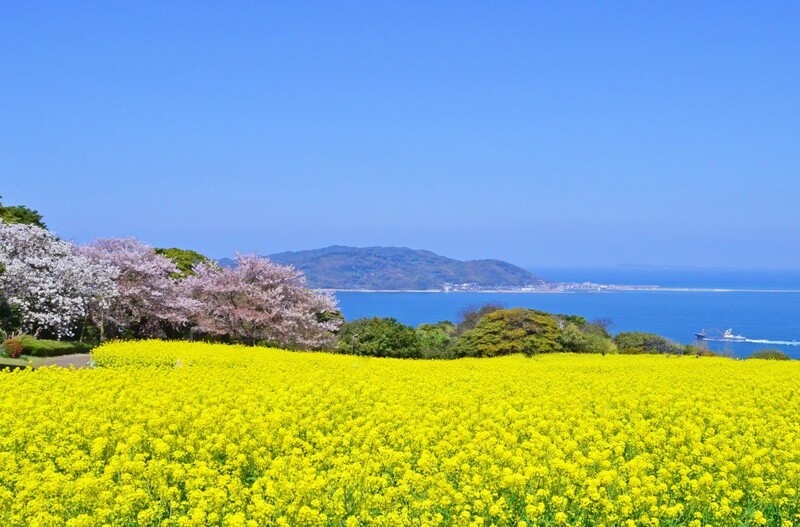 The contrast between the deep blue of the sea and sky and the sea of canola flowers viewed in a single, immense panoramic scene is almost indescribable, and the collaboration between the canola flowers, blossoming between late February and mid-April, with the cherry blossoms in late March will take your breath away. 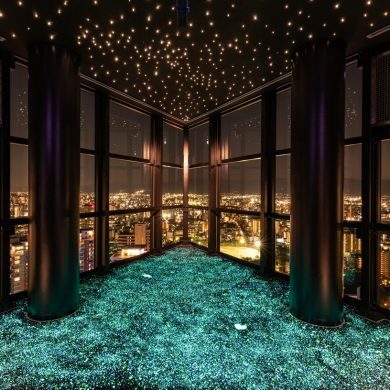 There is also nighttime illumination held during the cherry blossom season, providing an almost mystical experience different again from that of daytime viewing. 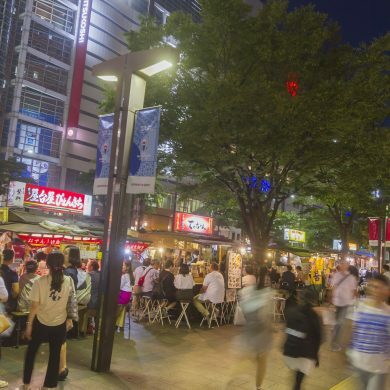 The park also features numerous other facilities making a day trip or overnight stay worthwhile, including the “Memory Lane” street that recreates the old Hakata village, a restaurant and barbecue house, a mini zoo, and overnight accommodations. Uminonakamichi Seaside Park can be enjoyed twice in a single season. Uminonakamichi Seaside Park is easily accessible from central Fukuoka city yet covers a huge area of land. 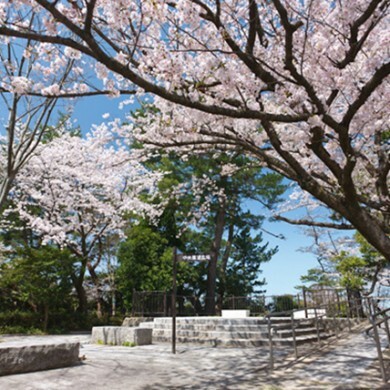 The park is famous as a place to enjoy the flowers of the different seasons. 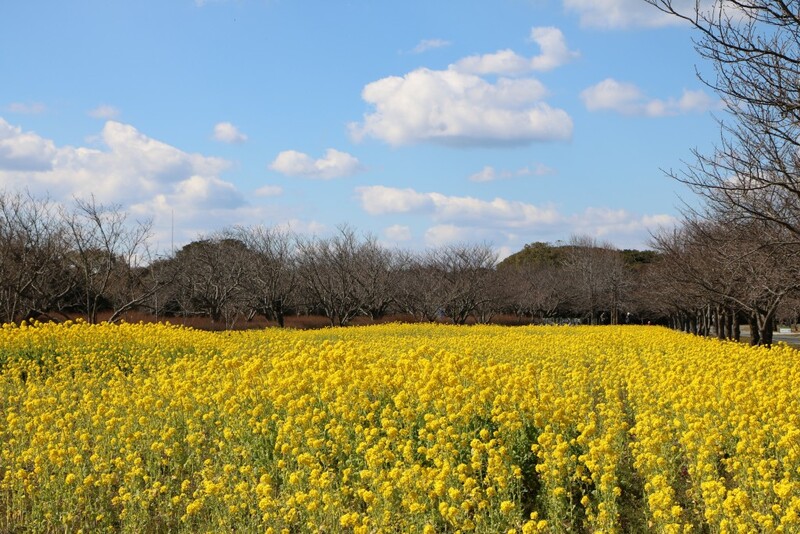 Two types of canola flowers are planted here, both early blooming and late blooming, so that visitors can enjoy the early blooming flowers during the entire month of February, and then the late blooming flowers from late March to early April. Furthermore, the late blooming canola bloom at almost the same time as the cherry blossoms allowing visitors to enjoy them in concert with each other. The park also features many other facilities for both children and adults to enjoy. There is the open zoological garden featuring animals such as capybaras and squirrel monkeys, a 12 km cycling course you can ride on with rented bicycles, and a mini amusement park, more than you could possibly see in only one day. From springtime through autumn, you can also enjoy a barbecue while taking in the beautiful view of Hakata bay. 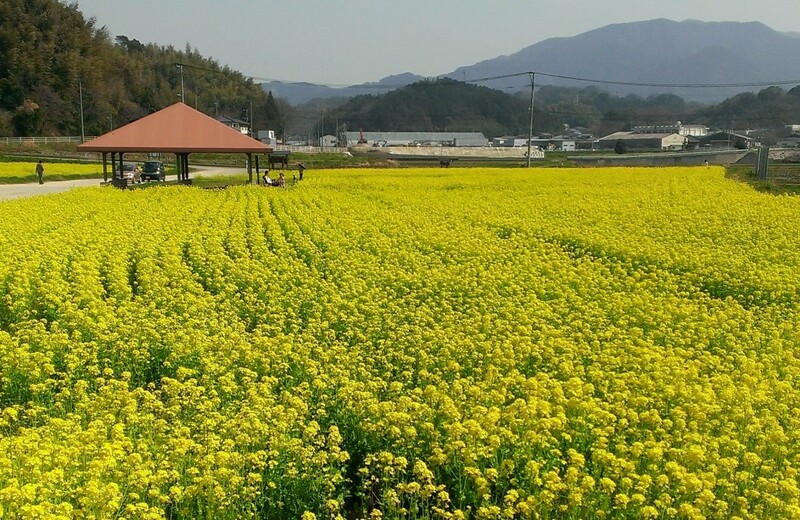 The Mushirouchi Nanohana no Michi (Mushirouchi Canola Flower Road) is situated in the Mushirouchi district of Koga city. The breathtaking view of almost five million canola flowers in chaotic bloom provides ample entertainment for any and all who visit. 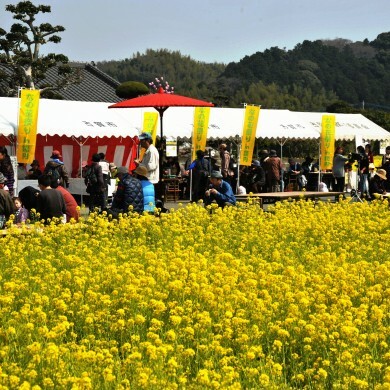 The “Nanohana (Canola) Festival” held in late March at the “Nanohana no Michi” in Mushirouchi, next to the Fukuoka Prefecture Hippodrome. A walking event is also held during the festival. 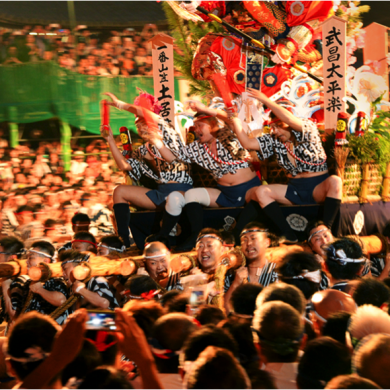 Participants leave from Koga station and follow a roughly 8.5 km course that visits various shrines and temples before reaching the Nanohana Festival venue. Accompanied by the gentle breezes of spring, this is an exceptional walk. Other attractions include pony riding and booths setup by shops selling local produce. Fukutsu city is located approximately mid-way between Fukuoka and Kitakyushu cities. The Saigogawa Flower Park is a flower garden built on the former site of a farm located near the entrance to the Namazu-no-Sato park, situated near the central basin of the Saigo river that flows through Fukutsu city. The 1.2 hectares of the park are filled almost entirely with canola flowers in late March. There are pavilions built in the park’s parking and rest areas which are perfect spots to enjoy picnics surrounded in flowers. This is an ideal spot to get your fill of springtime accompanied by the small white butterflies fluttering over the field of flowers. You can also visit in mid-October to see the cosmos flowers at full bloom. The Cosmos Festival is also held at this time featuring stage events and booths set up by local shops, accompanied by almost 700, 00 colorful cosmos flowers in shades of red, white, and pink. Each destination here features a scale of breathtaking proportions, and the contrast between the golden carpet of canola blossoms against the deep blue sea and sky coming right after the long and subdued winter cannot be missed. Here you are sure to find sites that you will not be able to resist capturing in photographs.